Gluten Free Piñata cake.. Sounds delish right? The idea came from this Super Food Idea's Pinterest post. In fact the idea came when my uncle made my soon to be 13 year old cousin an actual real life Piñata for her birthday. Now how cool is that?! When I was 13.. Well. We didn't have so much a party as a family get together due to my lack of friends.. But Eve, my lovely cousin, is blessed with popularity, and this cake perfectly embodies her. She is bright and bubbly on the outside, and even more so on the inside. So I set about discovering how I was going to make this. The recipe I had was for a normal cake, and we all know that substituting regular flour with Gluten Free flour is just a recipe for disaster, so the mission was to find a layer cake recipe worthy of our decorations. I ended up here, but it wasn't quite as simple as reproducing this recipe. The one in Super Food Idea's called for a massive 4 layers, and despite Eve's popularity I knew mine would plummet if I pulled a behemoth like that out of the fridge. Kids love cake, but they don't sit there and plow through half a kilo of it. 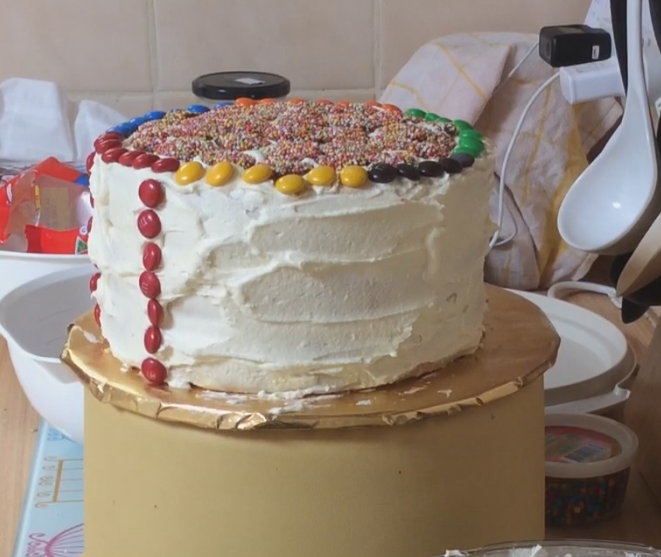 My initial thought was to bake 3 layers and cut one, thus creating 4 layers, and hollowing the middle two out to stuff with lollies and candy. 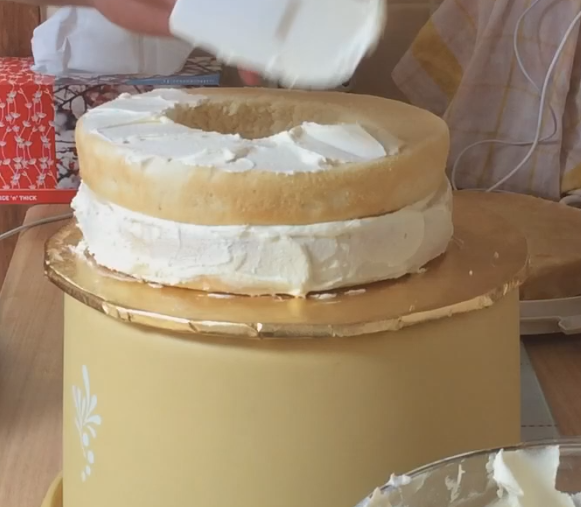 In the end, I just went with the 3 layers, and cut a 12cm round hole through the middle layer, and another 12cm hole in the bottom layer, which I then half scraped out, leaving enough cake on the bottom to ensure the whole thing didn't collapse in on itself. Without further adieu, here is the recipe in full, with my list of tips at the bottom. To be honest, you can decorate it however you wish. The cavity in the middle will hold around 1 1/2 a cup of candy. I used M&Ms, Chocolate Freckles, Jelly Beans, Mini M&Ms, and Mini Choc Bits. For the outside, I used 6 small Freddo Frogs, 1 1/2 cups of Choc Freckles, and a 400g bag of M&Ms to colour coordinate. All up, if you're in woolies, grab 400g M&Ms, 100g of M&M Minis, 100g Jelly Beans, 300g Choc Freckles and that should be plenty, with some leftovers to nosh on afterwards or during. 10. Allow to cool for 10 minutes in their tins, and then invert them on to wire cooling racks to cool completely. 4. Fill the cavity with lollies and chocolate!! 6. Decorate it in any way you wish. I started in the middle of the top of the cake and spread the Chocolate Freckles outwards. I then colour coded my M&Ms in a ring around the freckles, and using that colour as a base, I went down each side, forming a colour coded border. In the middle of the border I placed a freddo, and surrounded him with freckles. Your buttercream is incredibly sticky and if you firmly press (but dont push your cake over) the decorations on, they will stick! Now it is ready to serve! Place it in the fridge if you aren't quite ready to cut it yet, but it is best assembled on the day you are going to eat it. It will last a good 5 days in the fridge, and 3 months in the freezer. Don't tell the person who's cake it is what's in the middle. Chances are they will already be blown away by your decorations, and when they cut in to it the surprise will be even greater! You can honestly decorate the cake any way you want, and fill it with whatever you want. I have heard of people filling it with melted chocolate, so that when you cut in it oozes out. Custard is also a good filling, using your leftover egg yolks. Make sure that when you do ice the outside, you lay it on relatively thick to ensure your decorations stick nicely.